Welcome to Paper to Popcorn! 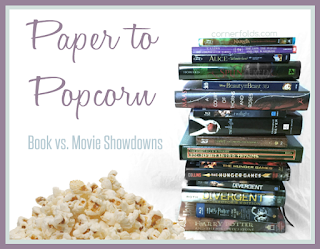 Paper to Popcorn is not be your typical book vs. movie comparison. The focus is on retellings, although there will be some features of movie vs. the source material. 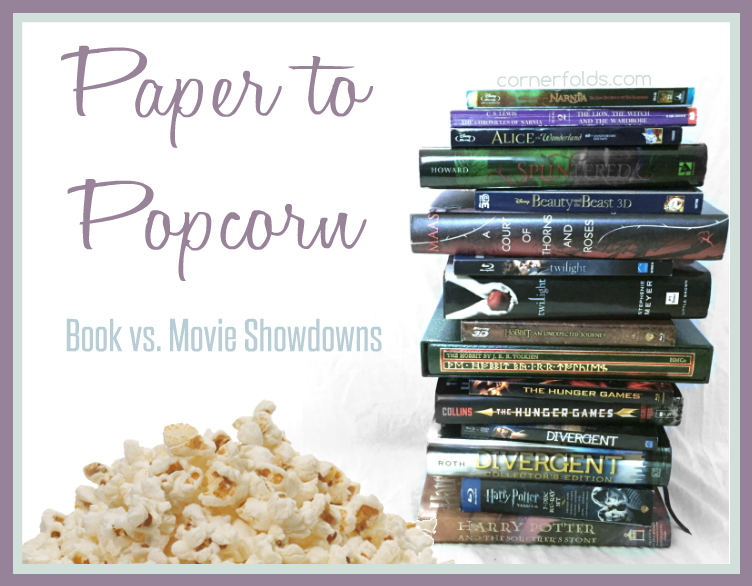 Each chosen book/movie combo will battle it out in a showdown to prove which one is the best on its own merits. Posts will feature reviews of both the film and book, rating scales, a brief outline of differences between the two, and characters, and ultimately a victor will be chosen. 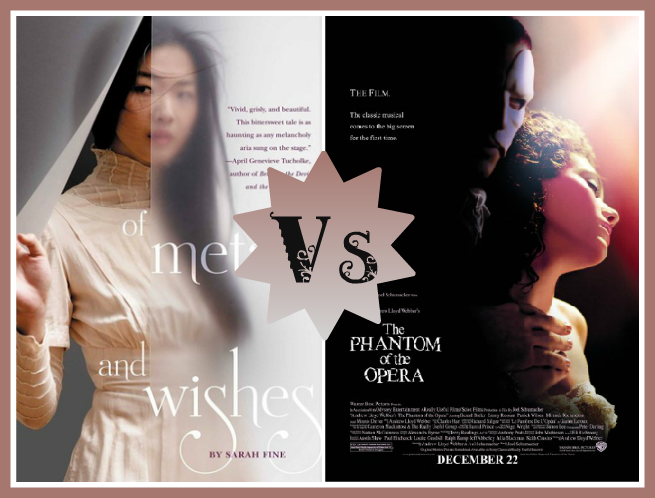 This week I'm featuring two Phantom of the Opera adaptations - Of Metal and Wishes by Sarah Fine, and Phantom of the Opera, the 2004 film. 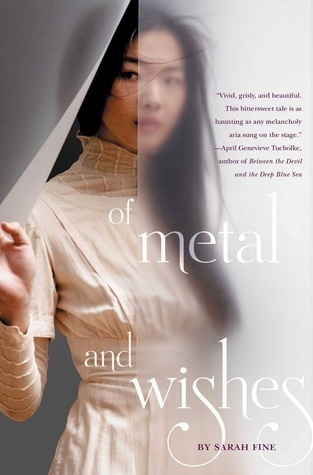 There are whispers of a ghost in the slaughterhouse where sixteen-year-old Wen assists her father in his medical clinic—a ghost who grants wishes to those who need them most. When one of the Noor, men hired as cheap factory labor, humiliates Wen, she makes an impulsive wish of her own, and the Ghost grants it. Brutally. Guilt-ridden, Wen befriends the Noor, including their outspoken leader, a young man named Melik. At the same time, she is lured by the mystery of the Ghost and learns he has been watching her... for a very long time. As deadly accidents fuel tensions within the factory, Wen must confront her growing feelings for Melik, who is enraged at the sadistic factory bosses and the prejudice faced by his people at the hand of Wen’s, and her need to appease the Ghost, who is determined to protect her against any threat—real or imagined. She must decide whom she can trust, because as her heart is torn, the factory is exploding around her... and she might go down with it. It was pure luck that brought Of Metal and Wishes across my path. I saw the second book in the series in a Waiting on Wednesday post recently, saw "Phantom of the Opera retelling," quickly found out it was a series, and searched my local library! I was so excited when I got my hands on this that I started it immediately and I was not at all disappointed. I have never been a fan of the steampunk genre (is it a genre?) and didn't actually realize this book fit that bill until it was too late to back out. There are metal spiders, metal appendages, metal rooms, metal war machines... there's metal in the title! But it really did work in this book. The setting is so realistically portrayed that it all fit together and I could see it like I was there. The mood was dreary and I felt like everything was shrouded in dust (or metal shavings) and it was amazing. The characters were one area I wasn't totally sure about at first. The society this book is set in is one in which women are extremely suppressed, have no rights, and are viewed as property. While this was really, REALLY hard for me to stomach, I did come to terms that this was just the way the world was and did not reflect the heroine, Wen (Christine), who is remarkably strong against such terrible odds. Although she is deeply respectful of her father, she also finds ways to be strong in her own way. 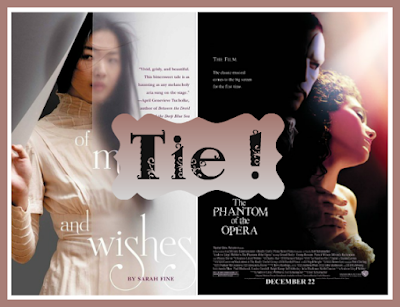 And of course a Phantom of the Opera retelling would not be complete without a love triangle! In fact, I think Phantom of the Opera was THE original love triangle (okay, maybe not, but I'm saying that) and that is why it works here. I will admit I felt incredibly confusing emotions over this. I have always been a Phantom fan but this book had me feeling things for Melik (Raoul) that I had to come to terms with. This book has made me a Raoul, er... Melik fan. I think this is because this is the first time I've ever seen the Raoul character written as multi-dimensional. The Ghost (Phantom) of this story is so easy to sympathize with, but I also understand the fear and uncertainty that Wen was feeling throughout the book. This whole situation is just a very uncomfortable one. My one, very minor complaint is that the writing seemed a little strange. It almost seemed like it was written in a different language and then translated to English. Then again, maybe this was done purposely to add to the overall feel of the story. This is a fantastic retelling that totally blew me away! It made me want to watch the movie so bad (incidentally, I did) and I was picturing scenes in the film as I read along with this new retelling of the story. It wraps up nicely at the end very similarly to how the movie (and original book) left off so it could really be read as a standalone in my opinion, although I'm very excited about book two! I highly recommend this to retelling and Phantom fans! Setting Terrible Just okay Pretty good Really good Amazing! Writing Terrible Just okay Pretty good Really good Amazing! Storyline Terrible Just okay Pretty good Really good Amazing! Cover Terrible Just okay Pretty good Really good Amazing! Based on the hit musical by Andrew Lloyd Webber, the tale tells the story of a disfigured musical genius that haunts the catacombs beneath the Paris Opera, waging a reign of terror over its occupants. When he falls fatally in love with the lovely Christine, the Phantom devotes himself to creating a new star for the Opera--exerting a strange sense of control over the young soprano as he nurtures her extraordinary talents. I first saw The Phantom of the Opera in early 2015 when it came to theaters. Back in the day Gerard Butler was at the very top of my man crush list with only Johnny Depp as a rival. I always thought the Phantom should have won out in the end and I'm a little hesitant to say my opinion hasn't changed much. It seems that a lot of people grow to love Raoul as they get older, but I'm team Phantom until the end! Let me start by saying this movie is visually stunning! I'm no expert when it comes to cinematography, but from my amateur point of view, this is one of the most beautifully filmed movies I've ever seen. Every time I see it, every single set and film angle takes my breath away. Likewise, the music is brilliant and I suppose we have Andrew Lloyd Webber to thank for that. The songs are amazing and give me chills every time. What woman could resist "Music of the Night" really? One area I've always had a problem with is the casting. Watching this again ten years after I was obsessed with it I think I've gotten some fresh perspective on it. I don't like Patrick Wilson in general. There are many reasons for this, but... I just am not a Patrick Wilson fan. That being said, I think he plays the role of Raoul very well and he sings the part amazingly. Emmy Rossum, though... I think she LOOKS the part of Christine, but... No. Her singing is pretty good (for most of the movie, anyway), but her face drives me crazy! She just sits there with her mouth hanging open for 75% of the movie. And I'll never understand why these two are the only ones with American accents... All of the minor characters are spectacular! Especially Carlotta, who I just love to hate! Then there's Erik/The Phantom. I feel like I need to bow down to the casting directors and thank them profusely. These people knew what they were doing with this character! The Phantom is undeniably gorgeous, dark, and seductive. He made me feel for him in so many ways, not the least of which was wanting him to win in the end! And I don't care what anyone says, Christine is totally into him when they're singing "Past the Point of No Return." I know a lot of people hate on Gerard Butler's vocals, but I feel like he is the strongest singer and the only one whose emotions I could FEEL! Chills. Every single time. My one final complaint is the big reveal of the Phantom. Even as a teenager I thought it was ridiculous that he was so perfect with the mask on and then as soon as he takes it off his hair is a different color, completely ruined, and the whole half of his face is messed up. Um... what? To be honest, re-watching it just now on my 60" screen I could totally see the elastic on the wig that Christine pulls off with the mask. Well, that illusion has just been ruined. Oh well. Other than Emmy Rossum and , this movie is almost perfect! This is one of the few films I can watch over and over! Even though the ending rips my heart out every single time. Cinematography Terrible Just okay Pretty good Really good Amazing! Screenplay Terrible Just okay Pretty good Really good Amazing! Performances Terrible Just okay Pretty good Really good Amazing! Music Terrible Just okay Pretty good Really good Amazing! 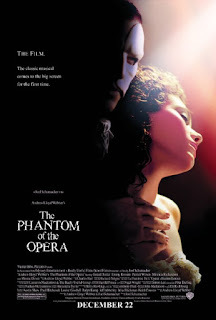 In Phantom of the Opera Christine is an orphan and she originally thinks the Phantom (Erik) is her father's ghost, but in Of Metal and Wishes Wen's father is a doctor. Erik teaches Christine to sing, which is how their relationship begins, but in Of Metal and Wishes, the Ghost does not teach Wen anything. Instead, he's just kind of a creepy stalker. Raoul is a very boring, one-dimensional White Knight character in Phantom of the Opera, but Melik is written to be the obvious love interest in Of Metal and Wishes. In The Phantom of the Opera Christine pulls off Erik's mask without his permission, but in Of Metal and Wishes, she has his permission. Erik and Raoul fight in The Phantom of the Opera with Raoul almost winning, but no fight occurs in Of Metal and Wishes. 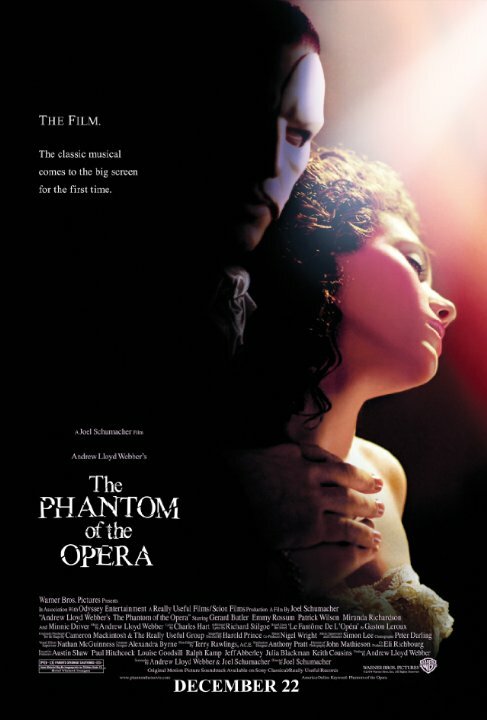 Christine helps to set up Erik in The Phantom of the Opera, but there is not a betrayal in Of Metal and Wishes. There's no huge final choice in Of Metal and Wishes and no threat to make Wen choose. Not too surprisingly, this one is a tie! Both of these are beautiful (though very different) adaptations of an amazing piece of source material! One made me want Christine (Wen) to end up with Raoul (Melik), while the other always, ALWAYS keeps me on team tall, dark, and handsome (Erik)! Both are completely amazing and both should be experienced by everyone! But... if you're not going to read the book, PLEASE at least spend two hours of your life seeing the movie!